Apple giveth and Apple taketh away. We lost FireWire connectivity, we’re gradually losing built-in optical drives, and on the latest MacBook Pros and MacBook Airs, we lost the Ethernet port. Never fear, Kanex comes to our rescue with their new DualRole Hub. The DualRole Hub is compact for travel and contains three USB 3.0 ports (also compatible with USB 2.0 devices) and a Gigabit Ethernet port. 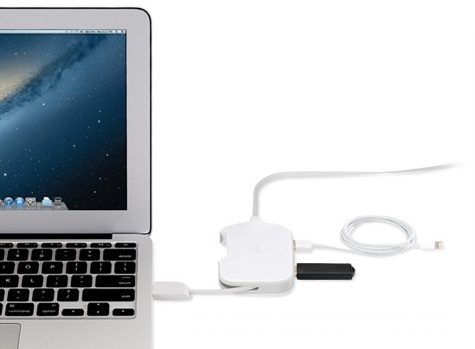 A short, fold-out USB cable plugs into your Mac. 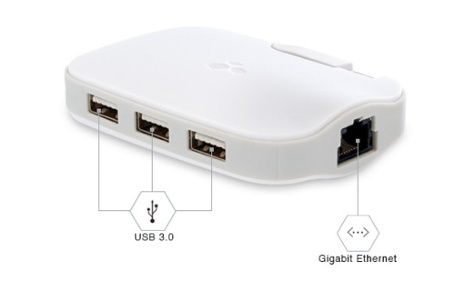 This provides the extra ports that are much needed for external drives, mice, and the portable devices we all need to carry these days. Gigabit Ethernet connectivity requires a driver download available from Kanex. The DualRole Hub gets warm when in use, but not hot. While not often needed by the typical road-warrior, an optional 5V power adapter is available so that the USB 3.0 ports can be bus-powered. This compact hub will easily fit in your bag. It’s only 3-3/4 by 2-1/2 inches and weighs but a few ounces. The built-in USB cable is a bit short and the price is a bit high, but the DualRole Hub is one accessory that is a must-have for most Mac users.